Originally bred as a gundog to handle big game like deer and bear, the “Silver Ghost” was a highly sought-after dog breed in its native Germany. Today, these elegant but demanding dogs can still be found out on the hunting grounds, but can also make a fine family friend if well exercised. See all Weimaraner characteristics below! Your first exposure to the Weimaraner may have been through the photographs, calendars, and books of William Wegman, a photographer who uses wigs, costumes, and props to capitalize on the breed's ability to assume almost human expressions. His ever-patient Weimaraners have impersonated Louis XIV, posed in bed watching television, and appeared as Little Red Riding Hood. But the Weimaraner's earliest job was to serve as an all-around hunting dog who handled big game such as deer, bear, and wolves. As Germany's forests shrank and big game became scarce, the Weimaraner's handlers turned the breed's talents to hunt birds, rabbits and foxes. He takes his name from the place in Germany where he was developed — the Court of Weimar, whose noblemen wanted a dog with courage married to intelligence, one with good scenting ability and speed and stamina on the trail.How they achieved their dream dog, first known as the Weimar Pointer, is unknown, but it's believed that the breeds bred to create the Weimaraner include the Bloodhound, the English Pointer, the German Shorthaired Pointer, the blue Great Dane, and the silver-gray Huehnerhund, or chicken dog.Today, Weimaraners are affectionately called Weims, Silver Ghosts, or Gray Ghosts. Part of their appeal lies in their sleek mouse-gray to silver-gray coat and light amber, blue-gray, or gray eyes. But there's far more to the Weimaraner than his distinctive appearance. The elegant, aristocratic dogs are loving and devoted. A Weimaraner's first desire is to be with his people, preferably within touching range. It's not for nothing that many Weimaraners bear the name Shadow. They'll lie at your feet or follow you through the house. Weimaraners aren't the breed for everyone, however. First-time dog owners need not apply. These dogs have a great deal of energy and stamina and need a lot of exercise and mental stimulation. Without it, they're likely to become nervous and high-strung. They can be quite a handful, with loads of energy to burn, and the intelligence to figure out how to get into trouble all on their own! Because they're hunting dogs, Weimaraners have a strong prey drive. If not trained or kept under control, they'll chase and kill anything that resembles prey, including cats and small dogs, mice, frogs, birds, and more. They will then proudly present you with their trophies. They'll also chase joggers and bicyclists. Despite their hunting instincts, Weimaraners are house dogs (like most dogs). They're temperamentally unsuited to living in a kennel or being kept in the backyard with little human interaction. Weims are independent thinkers and will constantly test your boundaries. If you haven't owned a Weimaraner before, you'll do well to attend puppy kindergarten followed by obedience class. Training should be gentle and firm, however, because harsh treatment will make him resentful. Once he's trained, the Weimaraner is a versatile dog who can be an up-close-and-personal hunting companion, compete in agility, and be a fine family friend. Weimaraners were bred to have a lot of energy and stamina. Be prepared to provide them with lots of exercise and mental stimulation. Weims aren't a soft-mouthed dog like a Golden Retriever and some have a low tolerance for small, furry animals, such as rabbits, and even cats and dogs. Until you know your dog well, watch him carefully when small animals are in his presence. Weims are high-strung dogs and can suffer from severe separation anxiety. If left alone for too long, they may bark, become destructive, or even injure themselves. Although Weimaraners are hunting dogs, they don't like living outdoors. They require a lot of attention and want to be close to you. Weims often are suspicious of strangers and can be unacceptably aggressive. Socializing them to many different people and situations when they are puppies and throughout their lives is critical. Weimaraners are intelligent and they think for themselves. Firm, consistent, gentle training must continue throughout their lives. Weimaraners can be difficult to housetrain. Crate training is recommended. Unethical breeders may advertise blue or black Weims as "rare" to attract buyers and will charge more for pups of these colors, but the truth is that blue and black Weimaraners are disqualified in the breed standard. Weims are intelligent and can learn quickly, but if their intelligence and energy aren't channeled constructively, they may learn some things you don't want them to know, such as how to open doors and escape. The Weimaraner dates to the early 19th century, when he was developed at the Weimar court in what is now Germany. The noblemen there loved hunting and they wanted a dog with courage, intelligence, good scenting ability, speed, and stamina. This dog would stick close to them as they walked in search of game and would be a close companion in the evening by the fireside. How they achieved their dream dog, first known as the Weimar Pointer, is unknown, but it's believed that the breeds used to create the Weimaraner included the Bloodhound, the English Pointer, the German Shorthaired Pointer, the blue Great Dane, and the silver-gray Huehnerhund, or chicken dog. As the decades passed, Germany's forests shrank and big game became scarce. The Weimaraner's handlers turned the breed's talents to hunt birds, rabbits and foxes. In 1897, an exclusive club was stared in Germany to maintain the breed and ensure that responsible breeders would oversee its development. No one was allowed to buy a Weimaraner unless they joined the club. Strict guidelines were imposed upon the breeding of Weimaraners. In 1929, Howard Knight, an American sportsman, was allowed to join the German club and bring two Weimaraner dogs to the U.S. The Germans were so protective of their "Gray Ghosts" that although Knight promised he would protect the purity of the breed, the club sent him two desexed dogs. Knight was not deterred, however. He kept working to get some foundation dogs that he could breed in the U.S. Finally, in 1938, he acquired three females and a male puppy. The females included two littermates, Adda and Dorle v. Schwarzen Kamp, and a year-old female named Aura v. Gailberg. The male puppy was named Mars aus der Wulfsreide. Other breeders joined Knight in his quest to breed Weimaraners in the U.S. and in 1942, the Weimaraner Club of American was formed. The American Kennel Club recognized the breed at the end of 1942. The breed made its formal show debut at the Westminster Kennel Club show in 1943. During World War II, it became difficult for German breeders to keep their dogs, so many outstanding Weimaraners were sent to the U.S. At the end of World War II, many American servicemen brought Weimaraners home with them, and they quickly grew in popularity, especially when President Dwight D. Eisenhower brought his Weimaraner, Heidi, to the White House. By the mid- to late 1950s, Weimaraners were the 12th most popular breed registered by the AKC. Unfortunately, as often happens, this led to a lot of irresponsible breeding. As the quality of the breed dropped and temperament problems became common, the Weimaraner's popularity fell. By the late 1960s, the number of Weim registrations fell to nearly half of what they had been in 1957. Registrations kept decreasing throughout the 1970s and 1980s. 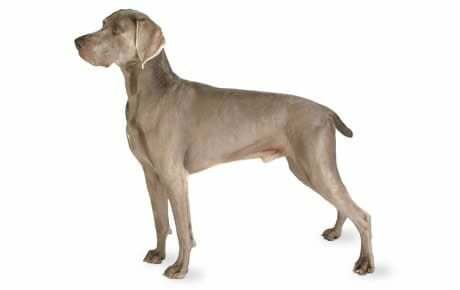 This allowed breeders who were dedicated to the breed (not just breeding puppies to sell) an opportunity to improve the health, temperament and conformation of the Weimaraner breed. Registrations began to climb in the 1990s, and today the Weimaraner is once again of the most popular breeds in America. He ranks 30th among the 155 breeds and varieties registered by the AKC. Male Weimaraners stand 25 to 27 inches at the shoulder and weigh 70 to 85 pounds. Females are between 23 and 25 inches tall and weigh 55 to 70 pounds. Early tales about the Weimaraner made it seem as if the dog came fully trained and was perfect in all respects. Even today, many people still hold this belief about the breed. Unfortunately for them, there's no such thing as a dog that comes programmed with good behavior. The typical Weimaraner is friendly, fearless, alert, and obedient, all traits that make him an excellent companion and watchdog. On the flip side, he's assertive, smart, restless, and willful. This is a dog who will take over the household if you give him half a chance. He'll chew, bark, chase cats, and steal the roast off the counter — if you don't give him the socialization, training, and structure he needs throughout his life.Aggression and shyness are temperament flaws that are seen in this breed. They must be dealt with early and may require the assistance of a behaviorist or experienced trainer to avoid serious behavior problems such as biting.Temperament is affected by a number of factors, including heredity, training, and socialization. Puppies with nice temperaments are curious and playful, willing to approach people and be held by them. Choose the middle-of-the-road puppy, not the one who's beating up his littermates or the one who's hiding in the corner. Always meet at least one of the parents — usually the mother is the one who's available — to ensure that they have nice temperaments that you're comfortable with. Meeting siblings or other relatives of the parents is also helpful for evaluating what a puppy will be like when he grows up.Like every dog, Weimaraners need early socialization — exposure to many different people, sights, sounds, and experiences — when they're young. For the Weim, however, socialization should continue throughout his life. Socialization helps ensure that your Weimaraner puppy grows up to be a well-rounded, outgoing, friendly dog and stays that way. Enrolling him in a puppy kindergarten class is a great start. Inviting visitors over regularly, and taking him to busy parks, stores that allow dogs, and on leisurely strolls to meet neighbors will also help him polish his social skills. Weimaraners are generally healthy, but like all breeds, they're prone to certain health conditions. Not all Weims will get any or all of these diseases, but it's important to be aware of them if you're considering this breed. If you're buying a puppy, find a good breeder who will show you health clearances for both your puppy's parents. Health clearances prove that a dog has been tested for and cleared of a particular condition. In Weims, you should expect to see health clearances from the Orthopedic Foundation for Animals (OFA) for hip dysplasia (with a score of fair or better), elbow dysplasia, hypothyroidism, and von Willebrand's disease; from Auburn University for thrombopathia; and from the Canine Eye Registry Foundation (CERF) certifying that eyes are normal. You can confirm health clearances by checking the OFA web site (offa.org). Gastric dilatation-volvulus (GDV), also called Bloat or Torsion: This is a life-threatening condition that can affect large, deep-chested dogs, especially if they are fed one large meal a day, eat rapidly, drink large volumes of water after eating, and exercise vigorously after eating. Some think that raised feeding dishes and type of food might be a factor in causing this to happen too. It is more common among older dogs. GDV occurs when the stomach is distended with gas or air and then twists (torsion). The dog is unable to belch or vomit to rid itself of the excess air in its stomach, and the normal return of blood to the heart is impeded. Blood pressure drops and the dog goes into shock. Without immediate medical attention, the dog can die. Suspect bloat if your dog has a distended abdomen, is salivating excessively and retching without throwing up. He also may be restless, depressed, lethargic, and weak with a rapid heart rate. It's important to get your dog to the vet as soon as possible. von Willebrand's Disease (vWD): This is an inherited blood disorder that is caused by a deficiency in clotting factor VIII antigen (von Willebrand factor). The primary sign is excessive bleeding after an injury or surgery. Other signs, such as nosebleeds, bleeding gums, or bleeding in the stomach or intestines may also be present. Most dogs with von Willebrand's disease lead normal lives. If you feel this is a concern, your vet can perform tests to determine if your dog has it. Distichiasis: This is a condition in which the dog has an extra row of eyelashes, usually on the lower lid, that cause irritation to the cornea and tearing. Entropion: This defect, which is usually obvious by six months of age, causes the eyelid to roll inward, irritating or injuring the eyeball. One or both eyes can be affected. If your Weimaraner has entropion, you may notice him rubbing at his eyes. The condition can be corrected surgically if necessary. Factor XI Deficiency: This is another bleeding disorder that usually is minor, but may become severe after trauma or surgery. Immune-mediated Disease: A small percentage of Weimaraner puppies react to vaccinations, particularly combination vaccines, with fever, elevated white blood count, and inflamed tissues and joints. Reactions occur most often at 12 to 16 weeks of age. The Weimaraner Club of America recommends that puppies be vaccinated only at 8 and 12 weeks of age with four core vaccines: distemper, adenovirus 2, parainfluenza, and parvovirus. The rabies vaccination can be given at 16 weeks of age. The first thing to know about the Weimaraner is that he's a housedog. He's not meant for kennel or backyard life, and he's also not suited to apartment living. This highly active dog needs a large, securely fenced yard where he can run, and an active family who can provide him with the exercise and mental stimulation he needs. A sense of humor helps as well, especially when you see how your Weim has relandscaped your yard in his efforts to rid it of mice, moles, and bugs. He'll be proud of himself for his good efforts, so don't forget to praise him as you calculate in your head how much time, money, and effort it will require to put the yard back the way you like it. You might want to supervise him more closely and provide him with additional exercise. Weimaraners need a couple of hours of exercise daily if you want to prevent recreational barking, chewing and digging. 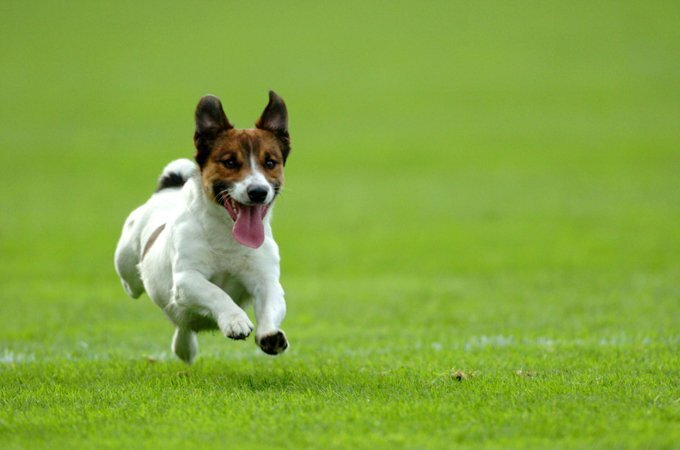 Play fetch and other running games, take him jogging or hiking, teach him to run alongside your bicycle, or get him involved in a dog sport such as agility or flyball. And, of course, you can always take him hunting.Be sure your yard is escape-proof. Weims are Houdinis when it comes to confinement, and they're very good at learning how to open doors and gates and jump over or dig under fences. That's another reason why it's best to have them as housedogs.In the house, a mature, well-trained Weimaraner will be your shadow, from bedroom to bathroom to kitchen to den. A Weimaraner puppy is a challenge and requires careful supervision. He can be a destructive chewer and difficult to housetrain. Crate training is a good idea. Weimaraners of any age with separation anxiety, which is not unusual in this breed, can become destructive and may "dig" in your carpet or sofa in an attempt to create a secure nest. It's certainly not a behavior problem, but be aware that Weimaraners have loose lips. Nope, they won't sink ships, but they will splash water everywhere when they drink. Keep hand towels handy to wipe their mouths and clean up spills. Weimaraners are highly intelligent, but they're also independent thinkers. That combination can make them a challenge when it comes to training. Be consistent and firm, but gentle. The Weimaraner is sensitive and doesn't respond well to anger, but you must be able to say "No" and mean it. Keep training sessions short and interesting, and always end them when he's done something right so you can praise him for a job well done. Last but not least, hold tight to your sense of humor. Your Weimaraner may or may not do as you ask, depending on any number of factors, but he'll always disobey with style. Among the talents your Weimaraner may acquire are getting ice from the dispenser in the door of your refrigerator, turning on faucets, and opening gates and doors — including refrigerator doors. It's a cinch to teach him tricks and you may want to do so, simply to keep him occupied and out of trouble. Recommended daily amount: 2.5 to 3.5 cups of high-quality dry food a day, divided into two meals. Note: How much your adult dog eats depends on his size, age, build, metabolism, and activity level. Dogs are individuals, just like people, and they don't all need the same amount of food. It almost goes without saying that a highly active dog will need more than a couch potato dog. The quality of dog food you buy also makes a difference — the better the dog food, the further it will go toward nourishing your dog and the less of it you'll need to shake into your dog's bowl.Keep your Weimaraner svelte by measuring his food and feeding him twice a day rather than leaving food out all the time. If you're unsure whether he's overweight, give him the eye test and the hands-on test. First, look down at him. You should be able to see a waist. Then place your hands on his back, thumbs along the spine, with the fingers spread downward. You should be able to feel but not see his ribs without having to press hard. If you can't, he needs less food and more exercise.For more on feeding your Weim, see our guidelines for buying the right food, feeding your puppy, and feeding your adult dog. The Weimaraner's coat is short, smooth, sleek, and solid-colored, ranging from mouse-gray to silver-gray, usually with lighter shades on the head and ears. A distinctly long coat is a disqualification according to the American Kennel Club breed standard — a written description of how a breed looks — but in European countries a longhaired variety is recognized. Longhaired Weimaraners have a silky coat and feathering on their tails and legs, but they are rarely seen in this country.A Weim's nose is dark gray. Inside the flaps of the ears and on the lips, where the coat is thin or nonexistent, the skin is pink, not white or black.A Weimaraner is one of the easiest breeds to groom. Even when he has been running through mud, the dirt just seems to fall off him. Weekly brushing with a bristle brush should keep his coat and skin healthy. Weimaraners shed, but brushing will help keep loose hair off your clothes and furniture. To make his silvery coat shine, wipe him down with a chamois. Bathe when needed. He takes great pleasure in rolling in anything stinky, so this may be more often than would normally be necessary. All breeds with pendant, or hanging, ears tend to have issues with ear infections. Check your Weimaraner's ears weekly and wipe them out with a cotton ball moistened with a cleanser recommended by your veterinarian. Never stick cotton swabs or anything else into the ear canal or you might damage it. Your Weimaraner may have an ear infection if the inside of the ear smells bad, looks red or seems tender, or he frequently shakes his head or scratches at his ear.Brush your Weimaraner's teeth at least two or three times a week to remove tartar buildup and the bacteria that lurk inside it. Daily brushing is even better if you want to prevent gum disease and bad breath.Trim nails once or twice a month if your dog doesn't wear them down naturally. If you can hear them clicking on the floor, they're too long. Short, neatly trimmed nails keep the feet in good condition and prevent your legs from getting scratched when your Weimaraner enthusiastically jumps up to greet you. Begin accustoming your Weimaraner to being brushed and examined when he's a puppy. Handle his paws frequently — dogs are touchy about their feet — and look inside his mouth and ears. Make grooming a positive experience filled with praise and rewards, and you'll lay the groundwork for easy veterinary exams and other handling when he's an adult.As you groom, check for sores, rashes, or signs of infection such as redness, tenderness, or inflammation on the skin, in the ears, nose, mouth, and eyes, and on the feet. Eyes should be clear, with no redness or discharge. Your careful weekly exam will help you spot potential health problems early. For an active older child who's familiar with dogs, a Weimaraner can be a great companion. They're far too rambunctious for toddlers, however, and may chase small children who are running. Always teach children how to approach and touch dogs, and always supervise any interactions between dogs and young children to prevent any biting or ear or tail pulling on the part of either party. Teach your child never to approach any dog while he's eating or sleeping or to try to take the dog's food away. No dog, no matter how friendly, should ever be left unsupervised with a child. Weimaraners are not the best choice for families with cats, small dogs, rabbits, hamsters, gerbils, or birds. Weimaraners have a strong prey drive and it's difficult, if not impossible, to redirect that instinct. They will go after and kill, if possible, any small or large furry animals they see. Weimaraners are often purchased without any clear understanding of what goes into owning one. There are many Weimaraners in need of adoption and or fostering. There are a number of rescues that we have not listed. If you don't see a rescue listed for your area, contact the national breed club or a local breed club and they can point you toward a Weimaraner rescue.